The Clinton’s aren’t public-spirited philanthropists. They’re shakedown artists. Greed and power, sir, pure greed, a quest for power. and no shame. Chelsea, Hillary and Bill Clinton bask in the limelight. When the Clintons moved out of the White House, thy hauled off $190,000 worth of china, flatware, rugs, televisions, sofas and other gifts. Greed without shame. When Bill Clinton left the White House he initially wanted to lease a fancy high-rise office in midtown Manhattan for $800,0000 a year, $500,000 of that to be covered by taxpayers, more than the annual office rent for ex-presidents Reagan, Carter and Ford combined. Greed without shame. 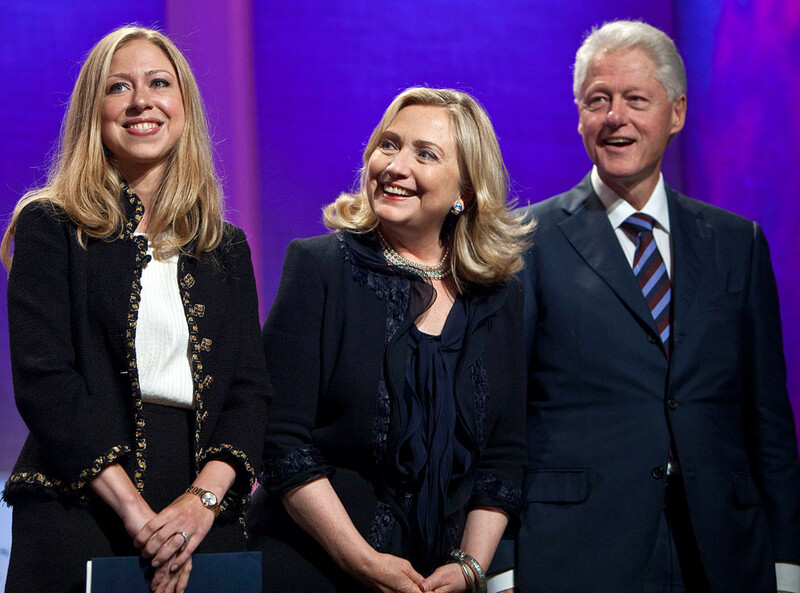 The Bill, Hillary and Chelsea Clinton Foundation has raised about $2 billion since it was founded in 2001. The money has come from foreign governments, corporate tycoons, politically-connected influencers, and other moneyed interests. Meanwhile, Bill and Hillary have raked in millions from speeches, many to groups with interests in government policies. Just between January 2001, when Bill Clinton left the White House, and January 2013, when Hillary stepped down as Secretary of State, Bill Clinton was paid $104.9 million for 542 speeches around the world, according to an analysis by the Washington Post. After leaving the State Department, Hillary joined the money rush with speeches for which she earned $200,000 or more per appearance. Even the Clintons’ daughter, Chelsea, has learned “the family business.” With no media experience, she secured a $600,000 a year job as a “special correspondent” for NBC News in 2011 that lasted until mid-2014. Her uninspiring performance earned her the distinction of being called “one of the most boring people of her era” by Washington Post Style reporter, Hank Stueverof. “We came out of the White House not only dead broke but in debt,” Hillary said. Not any more. At its essence, the Clinton’s money haul, both the personal haul and the fundraising for their foundation, are part of a massive pay-to-play scheme. The foundation’s programs run the gamut from climate change and economic development to public health and woman and girls, and it claims to be impacting lives around the world. But the simple fact is that thousands of other non-profits in the U.S. and around the world were doing the same work when the Clinton Foundation was created and are continuing to do so, often while starved for funds. If the Clintons really wanted to advance causes dear to their hearts after leaving the White House, they could have checked Charity Navigator and advocated on behalf of already established, exemplary non-profits, rather than creating another hydra-headed creature focused on promoting the brand of its founders. In short, there was absolutely no need to create the behemoth that is the Clinton Foundation. The only reason for creating it was to give the Clintons a platform for self-aggrandizement, to allow powerful U. S. and foreign interests to curry favor with a former President and maybe a future one. NOTE: Charity Navigator refuses to rate the Bill, Hillary and Chelsea Clinton Foundation, noting that “…this charity’s atypical business model can not be accurately captured in our current rating methodology.” Instead, the Foundation has been placed on Charity Navigator’s “Watchlist” in light of issues raised about its operations. “…given that our primary obligation is to donors, Charity Navigator has determined that the nature of this/these issue(s) warrants highlighting the information available so that donors are aware of the issues in question which may be relevant to their decision whether to contribute to this organization.” Another non-profit on the Watchlist is Al Sharpton’s National Action Network, cited for failing to pay payroll taxes. “With the tax liability outstanding, Mr. Sharpton traveled first class and collected a sizable salary, the kind of practice by nonprofit groups that the United States Treasury’s inspector general for tax administration recently characterized as ‘abusive,’ or ‘potentially criminal’ if the failure to turn over or collect taxes is willful,” the New York Times reported in 2014. Want to know how to win friends and influence publishers: give them money. 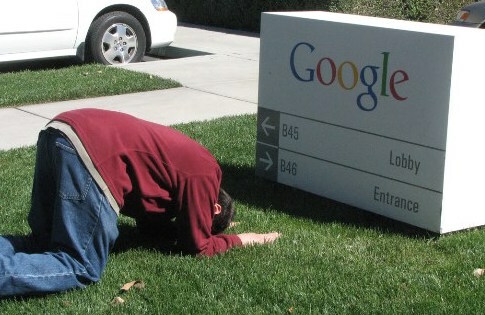 So much for Google’s “Do no evil” mantra. Its decision to launch a “Digital News Initiative” with eight news publishers in Europe is a clear effort to influence news coverage and political activity. Publishers that value their integrity and know journalism should just say no. Google is facing a European Union investigation into allegations that it has abused its monopoly positions in online search and has improperly bundled its Android apps. Despite the timing, Google insists that the digital initiative is not simply a P.R. effort or an attempt to discourage major media from undermining the company’s business goals. Sure. In Google’s early years, it declared that one of the ten things it knew to be true was, “You can make money without doing evil.” Apparently it’s changed its mind. At the same time, newspapers used to believe that their job was to be speak the unvarnished truth. As Adolph S. Ochs, the founding father of the modern New York Times, declared more than a century ago, 100 years ago, the paper was committed “…to give the news impartially, without fear or favor, regardless of party, sect, or interests involved…” Apparently some newspapers trying to adapt to the new digital world have changed their mind, too. Google announced today (April 28) that the initiative will initially have eight publishing partners: the Financial Times; Les Echos in France; NRC Media in the Netherlands; El Pais in Spain; La Stampa in Italy, Faz and Die Zeit in Germany; and the Guardian in the U.K. Publications from Rupert Murdoch’s News Corp are noticeably absent. Founding partners also include The European Journalism Centre (EJC), The Global Editors Network (GEN), and The International News Media Association (INMA). Publications from Rupert Murdoch’s News Corp are noticeably absent. Create a €150m ($164 million) innovation fund to support and stimulate innovation in digital news journalism over the next three years. News publishers may try to rationalize such a partnership with Google, but the fact is this does not auger well for the their independence. As the saying goes, you are judged by the company you keep. The seeds of your newspaper’s demise are being planted by Facebook. In Oct. 2014, David Carr disclosed in the New York Times that Facebook had plans to host entire news stories from publications on its website, rather than just providing links to publishers’ sites. Stories would live inside Facebook and be hosted by its servers, accompanied by ads sold by Facebook. Under such an arrangement, Facebook would decide what stories go on the site. It would become the news gatekeeper for millions of people and the relationship between news producers and their audience would be severed. News originators would get wider distribution of their content, but data gathered on users would be owned and used by Facebook, not the news creators. 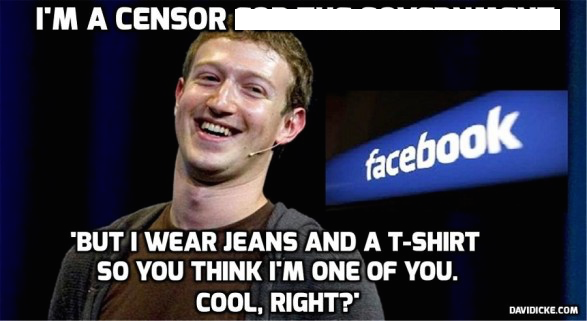 “Media companies would essentially be serfs in a kingdom that Facebook owns,” Carr wrote. Or as I’d put it, Facebook would be a para-site, sucking the lifeblood out of other media and reaping most of the benefits in eyeballs, revenue and influence. Numerous online news sites already provide access to news stories, but most have a symbiotic relationship, with the aggregator providing just headline teases and links to the originating publication. The aggregator, such as Google News, News360, and Drudge Report is doing no original reporting, while benefiting from advertising revenue, but the originator benefits from additional traffic. Andy Mitchell, Facebook’s Director of News and Global Media Partnerships, said earlier this month that 30 percent of adults and 88 percent of millennials in the United States get news via Facebook each month. That makes Facebook one of the most powerful news distributors on the planet. If it starts displaying entire stories, it will not only be displaying news, but determining who will see content. “Facebook is not, and knows quite well it is not, a neutral machine passing on news,” says George Brock, a British professor who writes on 21st century journalism. Hillary’s listening tour: Authenticity? Not! Hillary’s supposed low-key listening tour with the Scooby van this week was pitched as a spontaneous, truth-telling, interactive, unscripted escapade with everyday folks, a chance to reveal her authenticity. “It isn’t about her, it isn’t about us. It’s about Iowans, everyday Iowans, their hopes, their dreams,” Clinton’s campaign said. “That’s what you can expect for the next few weeks…real conversations about what matters for the country,” said Katie Dowd, digital director of Hillary’s campaign. But Hillary’s in a league of her own in terms of trying to manipulate reality, apparently believing that you can fool all the people all the time. 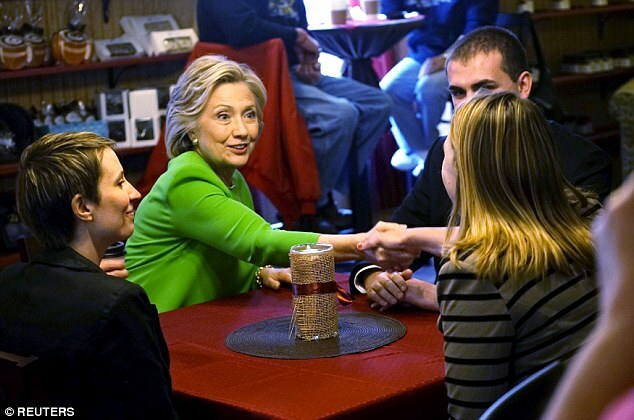 Hillary Clinton has a “spontaneous” conversation with patrons at a coffee shop in Le Claire, Iowa. “Clinton surprises customers at LeClaire coffee shop,” read the headline in a regional paper the next day. The initial reporting said Clinton spent an hour at the coffee shop talking with ordinary Americans Austin Bird, Sara Sedlacek and Carter Bell. Clinton ordered drinks, inquired about the menu and talked casually with the three. Sedlacek said they talked about education, health care and child care. It all looked so genuine, so unrehearsed. Aggressive media follow-up revealed, however, that the whole thing was carefully choreographed, a faux event, so to speak. Far from being regular folks who happened to be chatting over coffee when Hillary strolled in, all have Democratic party ties. Bird is a government and community relations coordinator at Genesis Health System in Davenport, Iowa, according to his LinkedIn profile. He interned with President Obama’s 2012 presidential re-election campaign and chauffeured Vice President Joe Biden when he visited Davenport in Oct. 2014. Bell is president of the University of Iowa College Democrats. Sedlacek is an employee at Planned Parenthood of the Heartland. Planned Parenthood’s PAC contributed $588,918 to federal candidates in 2014, every single penny to Democrats, according to the Center for Responsive Politics. Bird admitted that Troy Price, political director of Clinton’s Iowa campaign, called and asked him, Bell and Sedlacek to meet him Tuesday morning at a the Village Inn restaurant in nearby Davenport, Iowa. Price vetted them for about half an hour and then drove them to the coffee house to meet Clinton. Authenticity. Spontaneity. Openness. Not exactly. Expect more of the same over the next 18 months or so. Batteries don’t charge up electric cars; government subsidies do. At least that’s what supporters of a bill now before the Oregon House seem to believe. The bill, H.B. 2092, would establish an Incentive Fund to make rebates of up to $3000 to purchasers of alternative fuel vehicles, including those that are powered by batteries or hydrogen fuel and gasoline-electric vehicles. Rebates from the fund could total as much as $30 million per biennium and would be on top of the already absurd federal subsidy of up to $7500. Just what we need, a $30 million government subsidy to purchasers of pricey cars, when Oregon is already one of the top states for EV market share and the state has many other more pressing concerns to address. The House Energy and Environment Committee held a public heating on the bill on April 2 and has a work session on the bill scheduled for today, April 16. Under the bill, state rebates would help affluent Oregonians buy vehicles such as the $43,000 BMW i3 and $135,000 i8, the $42,000 Mercedes B-Class, the $106,000 Tesla Model S P85D, and the $35,000 Chevy Volt. To put things in perspective, $30 million is more than the TOTAL state income tax liability of all personal filers in 16 Oregon counties in 2013: Baker County ($13.1 million), Crook ($18.2 million), Curry ($19.6 million), Gilliam ($12.1 million), Grant ($5.9 million), Harney ($5.1 million), Jefferson ($15.5 million), Lake ($6.2 million), Malheur ($17.6 million), Morrow ($11.1 million), Sherman ($2.6 million), Tillamook ($23.6 million), Union ($24.7 million), Wallowa ($6.1 million), Wasco ($23.6 million) and Wheeler ($1.3 million). If I lived in one of those counties I wouldn’t look kindly on all my personal state income tax payments going to this alternative fuel vehicle boondoggle. Let’s be honest here, folks. There are a lot of other places $30 million could be invested more wisely in Oregon. Seven Oregon counties have been losing population, Coos, Baker, Wallowa, Malheur, Grant, Wheeler, and Sherman. If the Legislature can find another $30 million to spend, why not use the $30 million to help these struggling counties attract businesses? Deserving young people around the state are dealing with the stresses and strains of trying to find the money to pay for post-secondary education. Why not put the $30 million in Oregon Opportunity Grants, the state’s need based financial aid program. The state invests in Employment Related Day Care in support of the Early Learning initiative, providing greater access to quality childcare for Oregon’s working families. How about adding $30 million to the budget for that? A potential decline in lottery revenues during the 2015-17 biennium is likely to present budget issues for the Oregon Parks and Recreation Department, Oregon Watershed Enhancement Board, Department of Agriculture, Department of Environmental Quality, Oregon Department of Fish and Wildlife, and the Oregon State Police Division of Fish and Wildlife. In addition, the Oregon Department of Fish and Wildlife is facing a significant budget shortfall. The legislature could help out the Natural Resource Program area by adding $30 million to its budget. The logical decision? Short-circuit this bill.